CHICAGO, IL – A new charity race competition, the 100 Club Challenge, is set to pit Chicagoland police and fire departments against each other for a good cause at the 2016 Transamerica Chicago Triathlon on August 28, 2016. Announced today at the 100 Club of Chicago’s annual board meeting held nearly 100 days out from the triathlon, the funds raised from the Challenge will benefit the 100 Club of Chicago and support its mission to provide for spouses of first responders who lost their lives in the line of duty. The winning team will be determined by a points system based on participation and competition. In addition to bragging rights, the winning team will be the first to hoist the 100 Club Challenge trophy and present the 100 Club of Chicago with a check for the funds raised from the competition at the official awards ceremony. Competition organizers set a fundraising goal of $25,000 this year. The public is encouraged to participate in the 100 Club Challenge through a separate 100 Club charity team, with individual and relay team options. All registration fees and donations will be given to the 100 Club of Chicago. 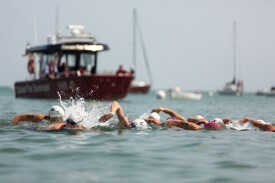 Visit www.chicagotriathlon.com to learn more about the 100 Club Challenge and to enroll in the competition. Produced by LIFE TIME ATHLETIC®, the Transamerica Chicago Triathlon is the world’s largest multisport event (swim, bike and run), having welcomed more than 250,000 triathletes across the finish line since it began in 1983. The 2016 Transamerica Chicago Triathlon will kick-off on Friday, August 26 and run through Sunday, August 28. During that weekend, downtown Chicago will be host to 5 races, 9,000 participants, 1,100 volunteers, and 55,000 spectators. The 100 Club of Chicago provides for the surviving spouses and dependents of law enforcement officers, firefighters and paramedics who lose their lives in the line of duty. This includes more than 45,000 federal, state, county and local officers, firefighters and paramedics stationed in Cook and Lake Counties. The 100 Club of Chicago offers several forms of financial assistance, access to resources and moral support. Through public donations and private fundraising efforts, the 100 Club of Chicago plans to raise more than $10,000 in direct contributions in 2016. Life Time is a privately held, comprehensive health and lifestyle company that offers a personalized and scientific approach to long-term health and wellness. Through its portfolio of distinctive resort-like destinations, athletic events and corporate health services, the Healthy Way of Life Company helps members achieve their goals everyday with the support of a team of dedicated professionals and an array of proprietary health assessments. As of May 2016 the company operates 119 centers in 26 states and 35 major markets under the LIFE TIME FITNESS® and LIFE TIME ATHLETIC® brands in the United States and Canada. Additional information is available at www.lifetimefitness.com.